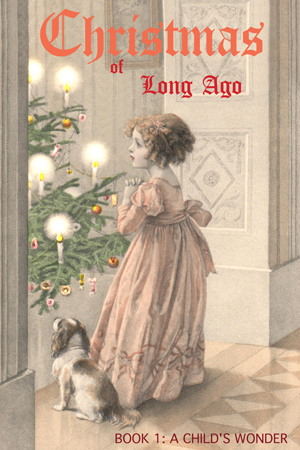 Christmas of Long Ago is a series of books of antique images depicting a time when society cherished the spiritual beauty of the Christmas season and lived its joy and wonder. This 8-book treasury represents in art all the traditional joys of Christmastide: home and hearth, family and loved ones, Santa and presents, sleigh rides and toboggans, holly and mistletoe, carols and candlelight, pageantry and worship, snowy peaks and glacier lakes, glowing lanterns and shimmering trees. We have also included devotional pictures of angels and the Holy Family taken from antique French and Bavarian holy cards, prized for their sacred rendering of the Christmas story and the wondrous birth of Christ. There is no greater beauty than the beauty of the divine. Christmas touches that beauty of the divine within us and makes us want to see and touch it in all we meet, if only for a season. In times past, men found beauty in a life of faith and service, in nature’s beauties, and in the love of family, church, and duty. They found God in classical music and philosophy, in the paintings and sculptures of the Masters, and in the enduring literature of the great dramatists, poets and novelists of the ages. During the late nineteenth and early twentieth centuries, children were treated to gorgeously illustrated books and annuals. World-class artists competed to render in drawing and lithography role models of virtue and loveliness. The offerings of beauty, even in the postcards and calendars of the day, were priceless, which is why collectors today will pay hundreds of dollars for such antiquarian items. Over twelve hundred of these precious images are contained in the eight books comprising Christmas of Long Ago, beginning with Book 1: A Child’s Wonder, which offers over 300 images of children. 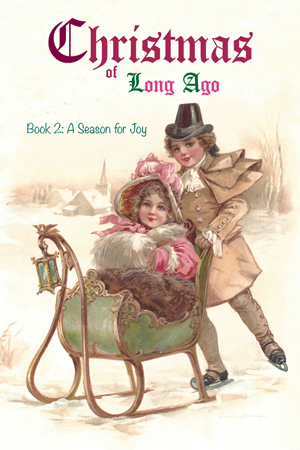 Book 2: A Season for Joy, contains nearly 400 beautiful renderings of Christmastide through the eyes of children. There are no Santas or angels included in these first two books of the series. 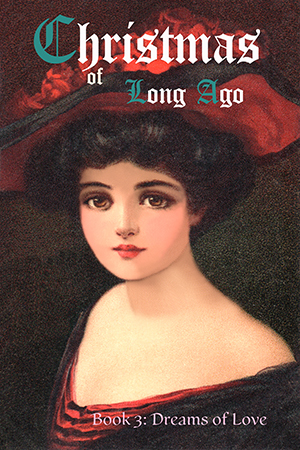 Poems, verses and stories from turn of the century authors accompany and give precious meaning to the gorgeous images. With few exceptions, our antique images are copyright free and originate from just about every corner and country of the western world. Since most of these chromolithographs are over one hundred years old, we took the liberty of cleaning and brightening them up, and in some cases making small alterations. The artwork is signatured by some of the most famous illustrators of the nineteenth and early twentieth centuries, such as America’s Ellen Clapsaddle, Maude Goodman, Frances Brundage, Jessie Wilcox Smith, Harrison Fisher and Clarence Underwood; England’s Margaret Tarrant, M. Bowley, Helen Jackson and A. L. Bowley; German painters Karl Feiertag and Alfred Mailick; Russia’s Sergey Solomko and Elizabeth Beam, and Austrian lithographers Josef Kranzle and H. Schubert, who illustrated for the very popular Vienne series of postcards. Their paintings and drawings graced the covers of The Saturday Evening Post, Harper’s Weekly, The Ladies Home Journal, Youth’s Companion, Frank Leslie’s Weekly, and Cosmopolitan, to name a few. Their portrayals of angels, men, women and children were ideal, appealing to all that was pure, reverent and true-hearted, and filled the pages of such leading children’s publishers as Raphael Tuck and Ernest Nister. Many of the antique prints contain their own original greetings in the language of the countries they represent. An international Language Key is offered to help the reader understand the various expressions of Christmas greetings from the different nations. Because these images comprise a lifetime of collecting, and include many rare chromolithographs, black and white lithographs and woodcuts, I wanted to make them available to readers. We spent a lot of time restoring them to their original beauty and purity, while taking care to preserve their old-world sweetness and charm. Our efforts extended to trade cards published between the 1870s and 1890s, when printing processes were primitive and resolution very poor. Instructions are offered at the back of the book for downloading your favorite images.